I love me a good sloppy joe. I have only the fondest memories of sloppy joes served up at childhood birthday parties, Halloween carnivals, and in the Wilson Elementary School cafeteria. No, I’m not kidding. Yes, I do remember all the other kids moaning and groaning about their sloppy joes and how freaking excited I was that it was sloppy joe day. I am Kate and I am a completely unapologetic lover of the sloppy joe. Since my kids also harbor a deep and abiding love of sloppy joes, we eat them quite often around our house and sometimes, just sometimes I think, “We should mix this up a little.” And then I banish the treasonous, cheating thoughts, until it comes creeping in again. Hawaiian style. I’m pretty sure there’s no such thing as a Hawaiian sloppy joe, or a Hawaiian-style sloppy joe, but this is my take on sloppy joes with a few little tropical twists. I’m using ground turkey and bacon (yep) instead of ground beef, although if ground turkey just isn’t your thing, ground beef would be equally delicious. reserving 2 tablespoons of the bacon drippings. 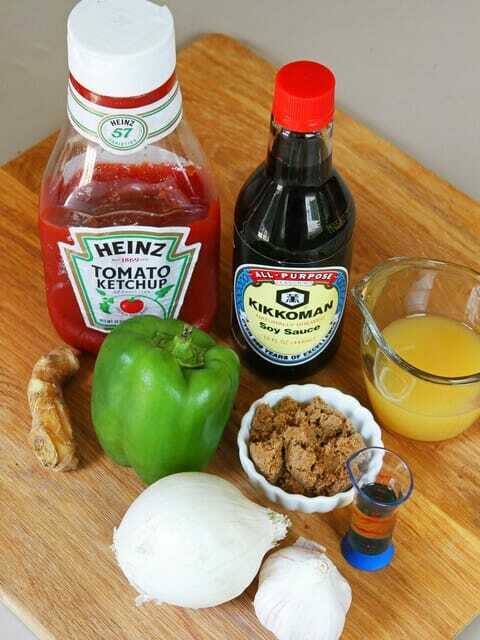 To make the sloppy joes, you’ll need an onion, a bell pepper, garlic, ginger, pineapple juice, ketchup, brown sugar, cider vinegar, liquid smoke, and soy sauce. Place the reserved bacon drippings in a large skillet and heat the skillet to medium heat. Add the ground turkey or beef, onion, and pepper and cook until the meat is about halfway cooked. Add the garlic and ginger and cook until the meat is completely cooked. While the meat is cooking, whisk the ketchup, brown sugar, vinegar, liquid smoke, and soy sauce together in a small bowl. Add the sauce to the browned meat and add the pineapple juice to the mixture, keeping in mind that the sauce will thicken. Bring to a simmer, then cover and reduce the heat to low and cook for 30 more minutes, stirring occasionally. When the mixture is done simmering, crumble the cooked bacon and add it to the sloppy joe mixture. Season to taste with salt and black pepper. Serve on sweet Hawaiian rolls with a slice of pineapple, a slice of red onion, and, if desired, a few banana pepper rings. Makes 6 servings. Brown the ground turkey or beef with the onion, green pepper, garlic, and ginger. Transfer to the slow cooker and add the sauce and combine well. 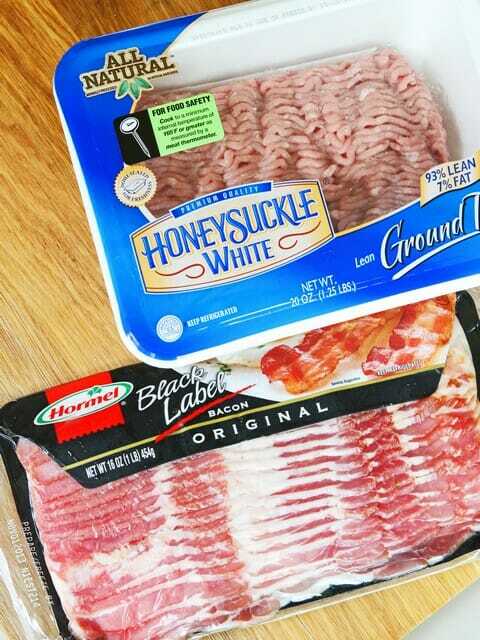 Before serving, add the bacon and season to taste with salt and pepper. Cook on low for 3-4 hours and serve as directed. 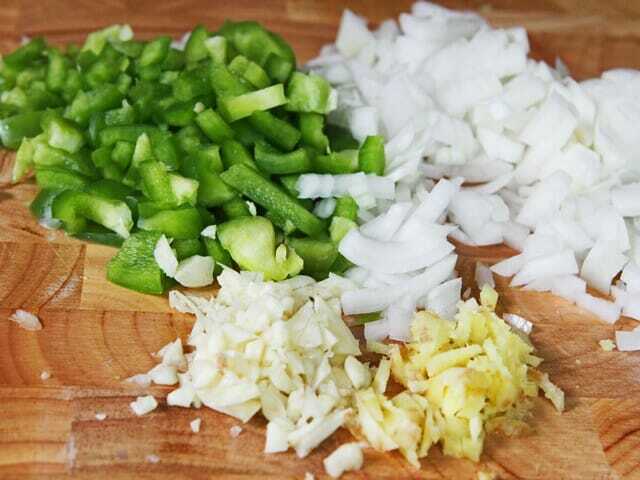 Brown the meat and onion, green pepper, garlic, and ginger. Transfer to a heavy-duty Ziploc bag or freezer container. Add the sauce and crumbled bacon and freeze. When ready to cook, transfer to a slow cooker and cook on low for 3-5 hours. Serve as directed. Preheat oven to 425. Lay each slice of bacon flat on a foil-lined baking sheet and bake for 15-18 minutes or until the bacon is crisp. 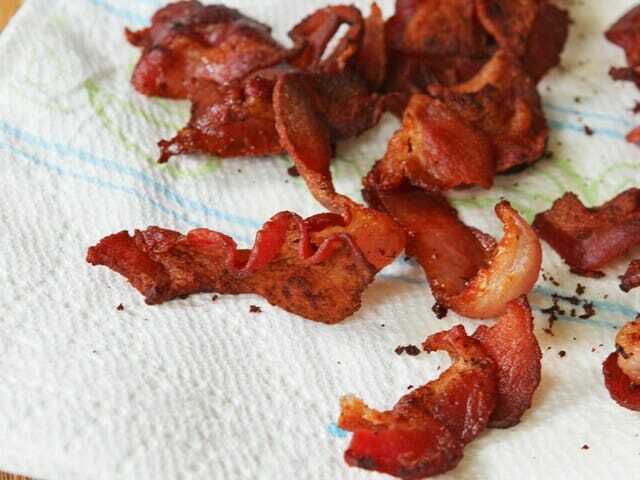 Remove from the oven and drain the bacon on a paper towel-lined plate, reserving 2 tablespoons of the bacon drippings. Place the bacon drippings in a large skillet and heat the skillet to medium heat. Add the ground turkey or beef, onion, and pepper and cook until the meat is about halfway cooked. Add the garlic and ginger and cook until the meat is completely cooked. Hi Kate! 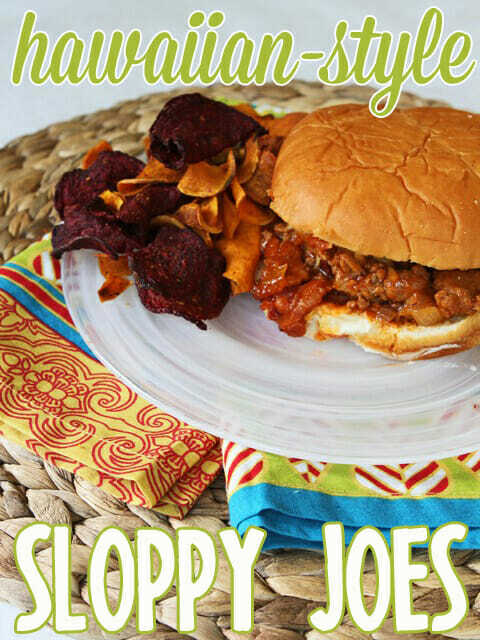 I’m Rita and I love sloppy joes too:) This recipe looks great and I love that I can put it in the crockpot! You rock! LOVE these!! Such a fun idea! Yum sounds good! We use turkey instead of beef in a lot of things. We just had your meatballs last night but made them using turkey and hot Italian turkey sausage and it was so good (I’ve made it with beef too, both ways are great!) Thanks for the great recipes! Would that be Wilson Elementary School just down the road from the Island Market? If so, my mom went to that elementary school 50+ years ago, and every time I visit my grandparents in Logan I drive right past that school. I’m sure that school has seen many wonderful people pass through its doors! This recipe looks WONDERFUL! YES! How funny! They tore down the last of the old parts of the school a few years back and it made me so sad that I can’t go over there. I also LOVE sloppy joes. This recipe sounds delicious. That bacon picture is not a very nice thing to do to a person who’s trying to watch what she eats. I’m not sure I can make it through this day without a big old slice of nice, hot, crispy bacon. Do you know a good way to clean drool off my keyboard? Wilson Elementary is where my nieces go to school! My boys are Ellis Eagles! I love Logan, especially now at fall time! 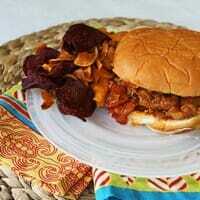 These Hawaiian sloppy joes look yummy, I’m excited to try them! I am a former Wilson Wildcat too! I was good citizen of the year in the 5th grade ya know. I know I’m pretty awesome right? ;)Recipe looks great! Did u make those yummy looking chips too? Are they sweet potato chips? I am going to give these a try. I think this would be really good with chicken breast too – Just cut your chicken into bite size pieces and serve on a bun or over rice. Yummy. Oooh, good call on the chicken. I love it. Today was Sloppy Joe day at our school and my daughter was soooo excited! What is Liquid Smoke and where can I get it?? Thanks! It’s just a smoke flavoring–I can usually find it near the sauces like ketchup, BBQ, Worcestershire, etc. Hope that helps! looks delicious. ever tried mixing little pepperonis into your sloppy joes and some shredded mozz. cheese on top? We love sloppy joes around here. Your dressed-up ones are our fave. Can’t wait to try this version. Everyone gave these a big thumbs up tonight! Wonderful flavors! Thank you for another family favorite!!! When you cook it in the crockpot do you add the Pineapple Juice the same way you would if you were to cook it in the skillet? Thank you. I made this recently, and it was delicious! I’m going to make it again for my son’s birthday party. With the freezer instructions, you just plop the frozen meal into the slow cooker and it’s done in 3-5 hrs? Sounds too easy! Made this tonight, delicious and easy! 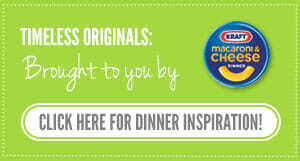 Just finished eating these for dinner tonight; they are truly awesome. Thank you! i just gotta say. i love myself a good sloppy joe ( or sloppy tom, rather since i eat more turkey than beef) and i love this recipe. its a hit all around. yum. Just made these last night…OH.MY.GOODNESS!!!!! These blew our minds delicious!!! They will to be on repeat in our home, at least monthly. Life changer for sloppy joes!!! Can you tell I loved these? Hahaha thanks for a great recipe! !